Yes, you got me absolutely right. Ava Garden is back with a new collection of sarafans, and something else to keep our "fashion dessers" warm throughout the following months. If you remember back in July we released a project-story Ava Garden's Sarafan that featured one of the denim sarafans from brand's Summer collection. As the first capsule collection was a success, young and ambitious designer Anna Petrova decided to give her main hallmark, i. e. sarafan, a more Autumn-ish mood. While sarafan-dress remains the core piece of Ava Garden, the emerging Latvian brand came up with a seasonal addition - knitted sweaters. Therefore, everyday dressing and mix'n'match process is ensured to get easier as days tend to get colder and colder every single morning and evening. Speaking of sarafans that used to be denim-ed back in sunny Summer days, this time each and every single piece is made of more seasonal fabrics and, this is my favorite part, wrapped in more seasonal patterns - stripes and checks. Loose fit is another puzzle piece of Ava Garden's essence. Sarafans, and now also sweaters, that don't perfectly cover your body curves, regarding the type, make you feel more than comfortable. Be you a student, a mother, professional fashionista - I sincerely believe sarafan can become your best friend in terms of practicality. And you know how much I appreciate practicality. With Ava Garden combination of striped sarafan and off-shoulder sweater you can be chic. You can be Geek Chic. Intellectual personalities who seem to care much more about technology rather than own appearance are basically the fashion heroes of the season. These weirdos can easily put together pieces that one would never be brave enough to mix yet look very original. 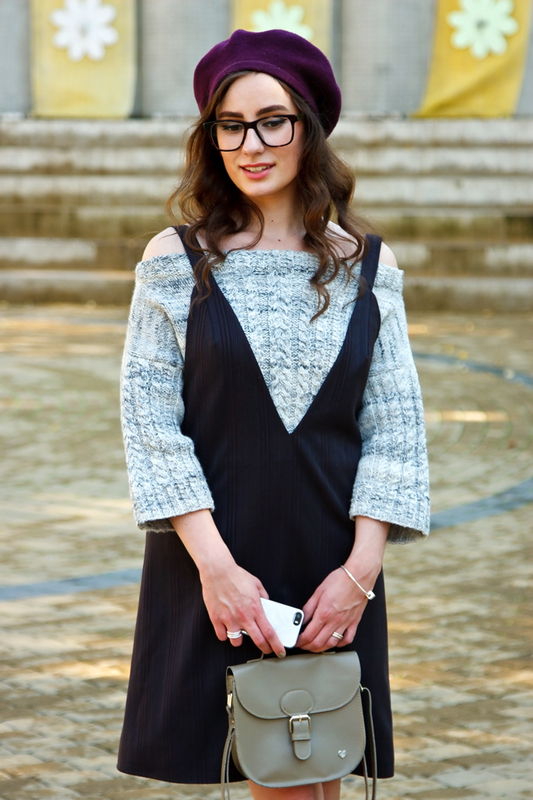 Off the beaten track was my primary idea to come up with such a combination of Ava Garden's Autumn staples, Firmoo glasses, beret and Miss Selfridge ankle booties. The thing is, I was always afraid of looking awkward, funny and less polished. But the time to reveal these sides of me has come and I can't be more happy to share it by means of such quirky fashionable look.